When it came to swimming, Ted Mullin's motto was "leave it in the pool." Mullin, who at 22 died of synovial sarcoma, a rare malignant tumor, was a collegiate athlete whose death has inspired thousands to support sarcoma research. Prior to his passing in 2006, his parents, Mary Henry and Rick Mullin, established the Ted Mullin Fund for Pediatric Sarcoma Research, which advances research in sarcoma and other rare pediatric cancers at the University of Chicago Medicine Comer Children's Hospital, where Ted was treated. Since its inception, the fund has generated more than $1.25 million, primarily through its flagship fundraising event, the Hour of Power. An annual swim relay, the Hour of Power has grown from 15 teams in its first year to as many as 180 teams and 8,700 athletes. Participants engage in continuous relays of any stroke for a full hour of all-out swimming. "This is a way of honoring Ted's spirit," said Mary Henry. "I think he'd be absolutely stunned that so many people are doing something in an effort to raise awareness and funds for this disease." The funds have been used for a variety of programs and projects, including: the Adolescent and Young Adult Oncology Program; evaluating the genetic basis of sarcomas; identifying novel markers of disease diagnosis or progression; developing new small molecule and cell therapies for resistant disease; and creating a comprehensive Pediatric Cancer Data Commons that centralizes data on pediatric cancers and makes it easily accessible to researchers. "Since the Ted Mullin Fund was established 12 years ago, it's had an amazing impact," said Susan Cohn, MD, professor of pediatrics and chief of the Section of Pediatric Hematology/Oncology at UChicago Medicine. "It has enabled us to not only gain new knowledge of the biological underpinnings of pediatric cancers, but is also informing the development of new treatments." In 2012, the Ted Mullin Fund expanded to include the Ted Mullin Scholars Program, which supports talented undergraduate student-athletes who participate in the Hour of Power and seek to learn more about research. Selected from a competitive pool of applicants from across the country, the scholars have the opportunity to gain hands-on laboratory and clinical experience by working closely with the world's leading pediatric cancer specialists at Comer Children's. "My experiences with shadowing in the clinic reaffirmed my desire to become a pediatrician," said Yifan Mao, a 2017 Ted Mullin Scholar. "This program was an incredible opportunity to explore and broaden my knowledge of medicine and science." To date, 29 students have completed the Ted Mullin Fund Scholars Program, the majority of whom have gone on to either pursue an advanced degree in medicine or enter a medicine-related career. "The scholars' studies focus on the biology of cancer and blood diseases, which are critical to our identification of new markers that determine diagnosis and predict outcome, as well as characterize novel therapeutic targets," said John Cunningham, MD, George M. Eisenberg Professor of Pediatrics and chair of the Department of Pediatrics. Mullin was a sophomore at Carleton College when he was diagnosed with the disease that affects one percent of cancer patients. He began swimming competitively in middle school, eventually competing on his high school's varsity swim team for three years. An honor roll student for eight semesters, Mullin was an Illinois State Scholar and was named an Academic All-American swimmer his senior year. 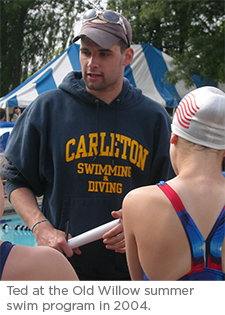 At Carleton, he majored in history, and was a member of the men's swimming and diving team and was twice elected captain. "He was a very good student and had a very strong analytical mind," added Rick Mullin. "If the University of Chicago can help create better outcomes for adolescents and young adults with this disease, that would be the most we can hope for."